I cannot even begin to express my excitement this year. Seriously, it’s inexplicable. Since we’ve lived in the mid-south (oh…almost 8 1/2 years), my husband and I have dreamed of having some local favorites in our yard. We’ve spent a lot of money trying to foster baby trees, adopt transplants, and have even received gift trees… yet they all died or simply did not bear one flower… until THIS year. Call it a spiritual rebirth, a new season in life, whatever you like. 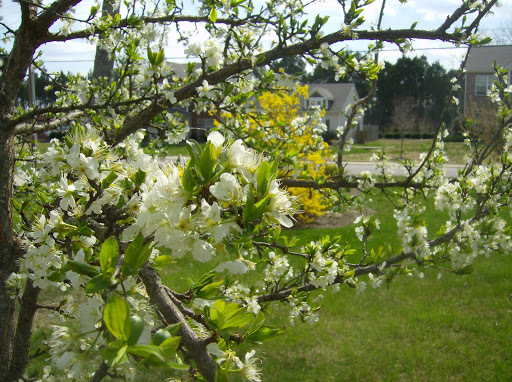 The fact of the matter is, this is the year of flowering trees. Our Magnolia Saucer (which normally looks like a bunch of tulips on a tree) was frost bitten a few years back. We left it alone since in it’s first healthy years had not produced one flower (we frowned, a lot). After thinking it was completely dead, it decided to grow back like a spindly bush. For two years or so it has been trying to make a comeback. 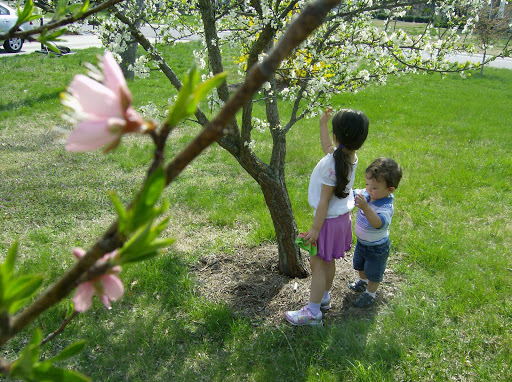 One day, after loading the kids in the car, I noticed a few pointed buds on the tiny bush-tree. “Could it be? Maybe it’s just leaves,” I thought. The next day, I took this picture (singing on the inside)! Our first Magnolia Saucer bloom!! Do you know what this means? Yet another lesson in life after death. Oh, and next year will be even better. Another sweet surprise was the Redbud. 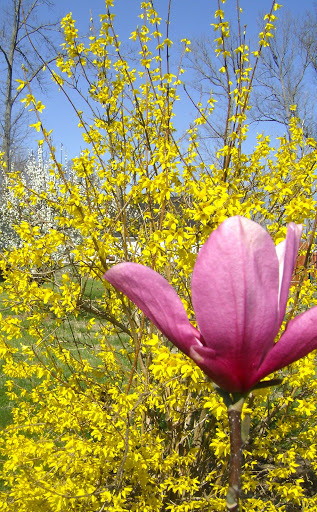 We’ve owned approximately five Redbud trees, most of which have been long gone. These suckers grow in the crevices of the stone cliffs by the road, in ditches along the countryside, and in every neighbor’s yard it seems. 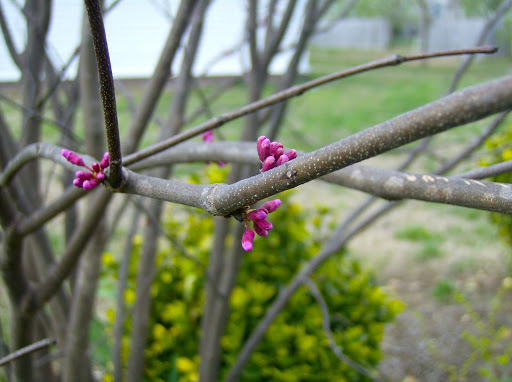 Why and how we were not able to maintain a living Redbud that could actually show its reddish pinkish buds is a complete mystery. After getting rid of a large diseased tree that almost flattened our house in a storm, one of the fostered Redbuds seemed to flourish. They are underlings, so we planted it…wait for it… UNDER another tree. It was tattered and broken, so it too decided to be a bush-tree. In its second year of being left alone–Houston, we have bud. 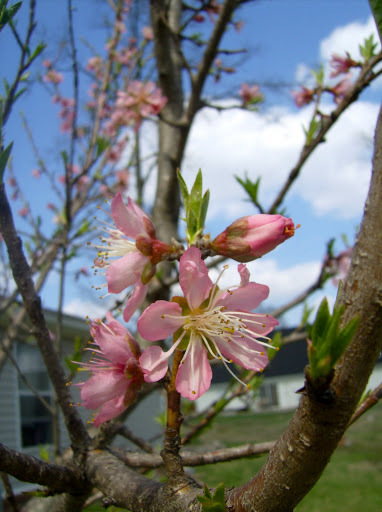 There is nothing like having a flowering tree looking back at you when you look out of a window. Spectacular. As for the rest of the yard, everything is doing pretty well. I’ve mentioned a few posts ago that our plum tree is back in business, and our nectarine looks like it will bear more fruit than ever. The Yoshino Cherry Tree makes me smile every morning when I pull the curtain back in the living room.